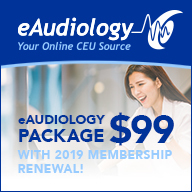 Please email your cancellation request to continuingeducation@audiology.org. Registration fees will be fully refunded if it is received 24 hours before the live Web seminar and at any time for on-demand sessions. In the event that Academy must cancel a Web seminar, 100% of the registration will be refunded. Please allow 10 - 14 days after the seminar for the processing of any refunds. Yes! The number of CEUs varies from Web seminar to Web seminar, and is displayed on the page describing each session. Upon completion of these steps, the credits will be posted to your Academy's record. Click here for information regarding the CE registry. PLEASE NOTE: CEUs are not available with the Academy Student Member rate. Test your computer's capabilities before you log into a live event to make sure that your computer is properly set up to view the Seminar. You will find a "Test" link on each product page that contains a live event. You will be able to access the live event directly from the product page found in your "Dashboard" page. You will be viewing the Web Seminar via web, and listening via streaming audio (through your computer's speakers), Test your web browser and your computer's audio system. If you cannot listen via your computer, please call 877-488-2666 for assistance. Widget for display only on FAQs sidebar.